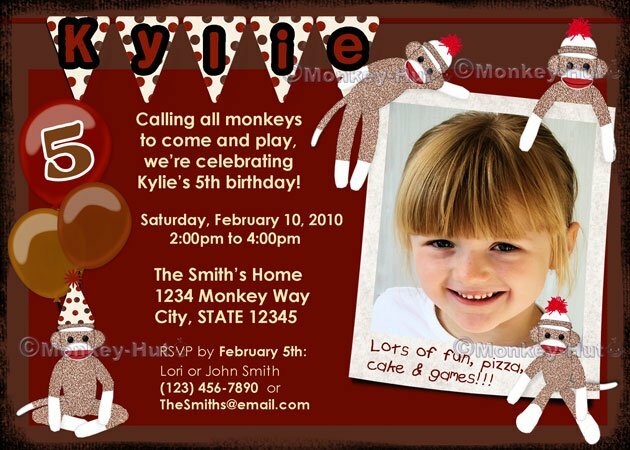 This is an adorable invitation for your little monkey's birthday! Lots of sock monkeys for your sock monkey lover! A design proof will be emailed to you within 1-3 business days. Once the design has been approved, you will receive a high resolution jpeg file for you to print at home or upload to the photo lab of your choice. (b) Child's name and birthday age. (c) Your own wording or as shown in the invite "Calling all monkeys to come and play, we're celebrating [child's name] [child's birth date] birthday!" "Our little monkey is turning ONE, come join us for some little fun!" "Swing on over and have some fun, [child's name] is turning ONE!!!" "Come hang out and join the fun, [child's name] is turning ONE!!! "Come monkey around with us for [child's name]'s [#] birthday!!!" "Monkey see! Monkey do! Our little monkey [child's name] is turning TWO!!!" the same format as sample shown including wording. (k) If you would like an EMAIL copy also. Great for email invites or for just as a reminder. 2. Email your photo (monkeyhut@gmx.com). Please note that I cannot use copyrighted professional photographer's photos, unless you have specific permission or printing rights from that photographer. 3. You will receive a proof within 1-3 business days. 4. Once you are happy with your proof, I will email you the final version in a high resolution jpg (jpeg) file, which you may either print it at home or upload the file to a printer of your choice. (ie Walmart, Walgreens, Target, CVS Pharmacy, Costco, Sam's Club, etc. or even online places like Snapfish, Shutterfly and KodakGallery.) You can have high quality invitations printed for as low as 9 cents per invitation. Copyright: ©All artwork, products, and images are ©2000-2010 Connie Girga (aka Monkey-Hut/MonkeyHut). Artist retains copyright and artwork images are NOT to be reproduced in any way. All rights reserved.